Portable instruments for fruit acidity in the world first. It is very much useful when you check out the acidity(or sourness) of fruits such as apple, citrus, grape, kiwi, orange, pear, pineapple, strawberry and etc. 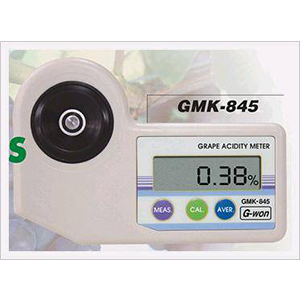 By the way, you can choose up to 3 different fruits among and make your own Digital Fruits Acidity Meter GMK-835N. Place some diluted fruit juice fully on the ‘Sample Well’. Press ‘MEAS’. button, and then the test result appears on LCD in about 10 seconds. Press ‘AVER’ button, and then the average data(up to 9 times)are available. It automatically switches off after a few seconds. Or Press ‘AVER’ button two times, and then the power is off.